The maple trees in the area have really outdone themselves this spring. For the past two weeks, they’ve been in vibrant bloom and last Thursday, with the rain, it was snowing maple blossoms. Just as in fall, when the weather causes the colorful leaves of each tree to drop directly beneath, resulting in eye-catching circles of red, yellow and orange carpeting the base of each tree, swaths of the sidewalk, street and parked cars were covered in tiny bright yellow flowers. It was something to see. We’re at the beginning of a week of sunny, warm, gorgeous fall color. Indian Summer is upon us. The unseasonably warm weather we’ve been having this winter is rolling right into spring and things are budding, blooming, and leafing out very much ahead of schedule. These last two days have been downright hot and humid, which makes me think we’re in for a wicked summer. In the meantime, it’s nice to see the first color of the season. Look what I discovered this afternoon. 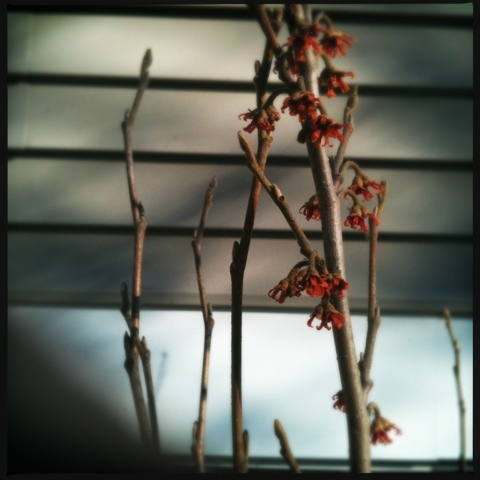 The witch hazel bushes that were planted last fall are showing the first tiny blooms of spring. The second week of February seems early to me, but that’s probably a product of our crazy-warm winter–the warmest in eighty years. While it’s nice to see a little (and I mean l-i-t-t-l-e) color in the yard, I’m still waiting for more snow. Hopefully I’ll get my wish tomorrow, when the prediction is for 6+ inches of lake effect snow. I’ll take it any way we can get it. JD had a week of camp out at the Chicago Botanic Garden and as luck would have it, it was during a ridiculously hot spell of weather, where the heat index blew past 100 each day we were out there. While she was digging for treasure, planting moon flowers, and learning about plants, I tried to keep cool, hydrating by the fountain and reading in the breeziest, shadiest places I could find. Here I am, hanging out in the basement bathroom with the cats, while we waited 40 minutes for the tornado warning to be called off. It's very rare to have a full-on, head-to-the-basement kind of tornado event here in Evanston, so close to Lake Michigan. Thankfully, this is only the second time in all the years I've lived here that we've had to do so. Apparently the damage in the area was extensive, with lots of downed power lines and trees. Other than a few flashes on and off of the electricity, we survived unscathed. Especially when you've opened up the fountain for the season. Nearly as quickly as the snow fell, the huge mounds and drifts are melting away.